Enjoy the scent of fall with our Autumn Sunrise Scentsy Room Spray. Our Autumn Sunrise room spray smells like a beautiful fall morning. The fragrance blend of tart pomegranate juice, spiced cinnamon sticks, ripened raspberries, and a touch of nutmeg is like a toasty warm blanket for your senses. Take advantage of our Autumn Sunrise Scentsy online discount. 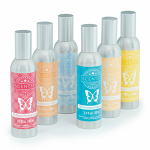 When you buy any 5 Scentsy Room Sprays, you’ll get an additional Scentsy Room Spray for FREE(you can select a combination of Scentsy Room Sprays of your choice). 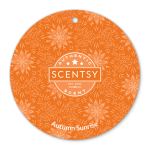 Our Scentsy Autumn Sunrise Scent Circle gives off just the right amount of on the go fragrance. Perfect for small spaces like garbage cans, hanging in the car, a locker, in your vacuum bag, and next to your desk. 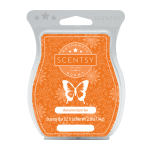 Bring back the crisp fall season with our Autumn Sunrise Scentsy Bar refill. Our Scentsy Bar refills are a high quality, soft wax. When used with our Scentsy electric candle warmers, you’ll enjoy the best quality and long lasting home fragrance in the industry. Simply break off a piece of the scored Scentsy wax and add it to your favorite Scentsy Warmer dish.